I spent the afternoon with David yesterday. I have to say, as I told VJ yesterday, I’m beginning to think that I’m starting to become about 20% Gentzsch. While I was there, I looked at a new fashion they’re designing and actually ended up doing some invoicing and shipment labeling while I was there. Not much has changed in that house (well, in some respects.) When you walk through the door, you just never have any idea what you’ll be doing. 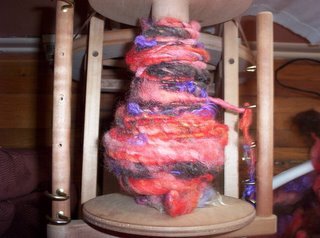 Spinning is all I’ve been able to think about and this morning I got up at 6:30 because I could hear the fibers calling me. And what do you know? I am starting to get the hang of it. Don’t get me wrong – I’m nowhere near anything even remotely resembling good, but I’m not failing miserably! I’m getting the wool to catch and spin and wind itself on the bobbin. I am starting to get the feel of where to hold the yarn and where to NOT hold, but simply guide, the wool. I’m getting a feel for the tension and the rhythm and the art. It’s art, ancient art. It’ll be a long time before I’m good, but I’m going to get there. What you see in the picture above is what I did this morning. There are loose sections and sections that are soooo tight, but it’s coming. I’d dare say that I’d certainly knit with what I made. No one else might wear the creation that came from it, but it’s a start. Hell, even Michelangelo had to learn to hold a brush at first, right? Ha! Maybe I’m about 10% Gentzsch then.